With the end of Summer upon us (or for me, Winter, but whatever), cinemas are seeing less and less profits from their showings. 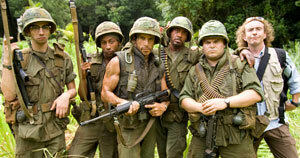 And though Tropic Thunder has once again managed to grab the top spot at the box office, it managed to do so with a measly $11.5 million. The blockbuster summer is definitely over, and who knows how long until we get one like it again. The highest placed newcomer to this weekend’s box office (I feel like I’m commentating at the Olympics) was Babylon A.D., which itself has been in the news lately due to its directors hatred of the movie. The movie’s director, Mathieu Kassovitz, came out earlier in the week blaming the likely poor performance on Fox, who he blamed for interfering in the process. Nevertheless, it did come in number two, with $9.7 million in takings. 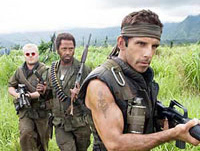 Far be it from me to ignore past inaccuracies in my own predictions, but it looks like Tropic Thunder has managed to hold on to its top spot at the box office for the weekend of August 22-24. Starring Ben Stiller, Jack Black, and Iron Man star Robert Downey Jr., Thunder managed to come away with a $16.1 million this weekend, dropping 37% from last week. Two newcomers arrived in at spots two and three, respectively, making a complete moron of me and my prediction that The Dark Knight would hit back up to number one this weekend. The House Bunny and Death Race came in respectively at two and three, with $27.3 million between them.